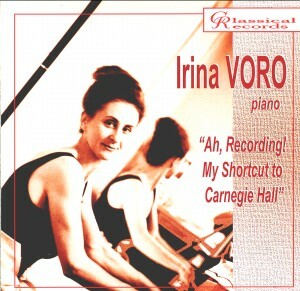 Award-winning teacher and performer Irina Voro has played as a recitalist, chamber musician and concerto soloist in Western Europe, China, North America and Russia. Dr. Voro, as she is known to her students at the University of Kentucky (USA), has a precious gift for uncovering the drama of the piece and telling the world something new, touching and wonderful - something the world is subconsciously looking for. From a very young age Irina has been creating personal stories about the pieces she plays. It is not surprising then that in the year 2000 she debuted at the Carnegie Hall with a performance called "L'Excital for piano, narrative and imagination", a performance in which she preceded the music of great composers with her own poetic narratives, subtly inviting listeners to find her stories in the music. This unusual combination was received so well that now Irina Voro is giving her L'Excitals around America and around the world, getting the most enthusiastic audience. Releasing a CD of "L'Excital" is her next recording project. CD Notes Probably every musician has heard that famous joke when a visitor asks a New Yorker - "How can I get to Carnegie Hall?" and gets the reply - "Practice, practice, practice". I don't know anyone who has performed at Carnegie Hall without countless hours of practicing. I certainly did my share of it. But, aside from simple practicing, to prepare for my Carnegie Hall debut, I recorded a lot. The genius of recording is that, along with all the right notes, intonations and feelings, it dutifully captures all the wrong ones and then exposes them back as a guide for further work, saving weeks of blind repetition. So, over the months of preparation for that recital, I was working with students and graduates of the sound recording program at McGill University (Montreal, Canada) usually in late night training sessions. In those grueling hours we all practiced our craft and, indeed, learned from it. For example, I realized that you don't shout to the sound engineer before the last echo of the last note has died in the hall; and my trainee engineers have learned that once you start recording in earnest, you stop fidgeting with controls.